I decided I wanted to go back to Coi. It had been about two years since my first visit. They are still on OpenTable.com, and I managed to book a 5:30 pm reservation on a Saturday night. 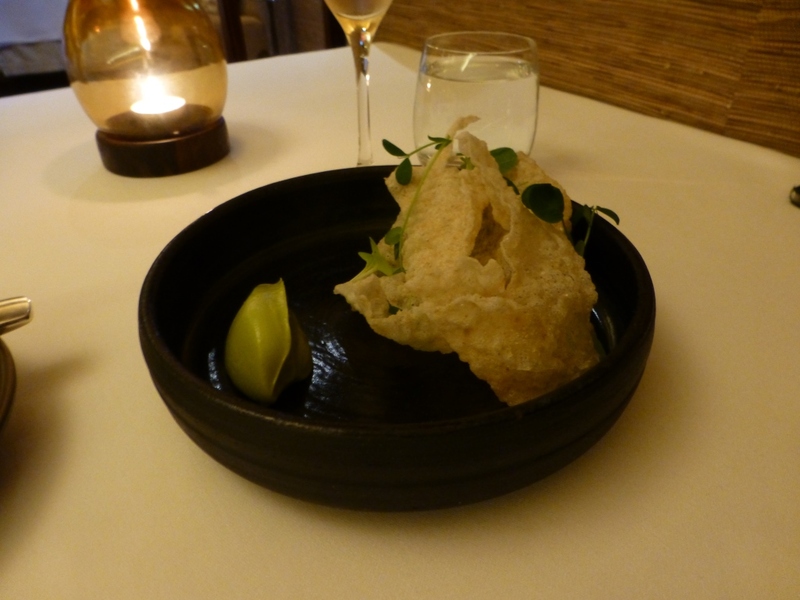 They have maintained their 2-star Michelin rating, and I wanted to see whether anything had changed. Upon my arrival, I was promptly taken to my table. I was the first guest of the evening to arrive. After I was asked whether I wanted sparkling or still water, a champagne flute soon arrived and they offered to pour a glass of what I took to be the house champagne (French, mostly Chablis, premier cru), which I accepted. The General Manager came by soon after to welcome me to the restaurant. Subsequently, after other guests arrived a little while later, I noticed that none of the other tables received the same treatment. I thought that perhaps they were trying to make me feel as comfortable as possible as a solo diner. I know that it wasn’t because this was a return visit, as I was asked a couple of times later in the evening if this was my first visit (which surprised me, as I would have thought such information would have been conveyed in the reservation by OpenTable.com). I was presented with the menus (wine, cocktails, and the tasting menu) was asked to let them know if I had any allergies, dietary restrictions or aversions. I told them that I really wasn’t much of a lamb eater, and they said they would check with the chef for alternatives. I had thought about ordering a glass of the offered Riesling, but I decided to wait and see how long the champagne would last through the courses.